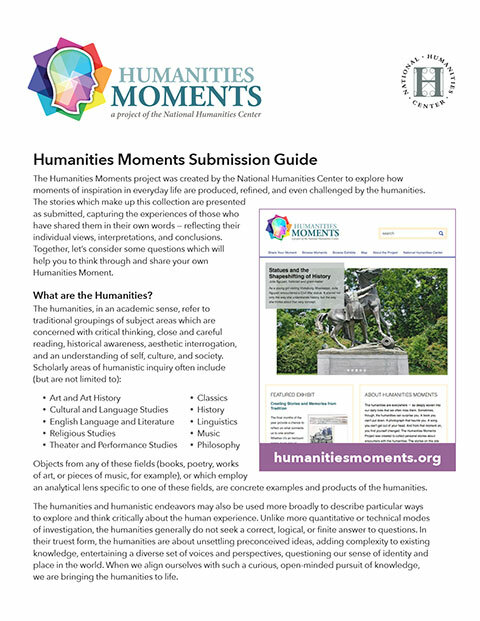 The Humanities Moments project was created by the National Humanities Center to explore how moments of inspiration in everyday life are produced, refined, and even challenged by the humanities. The stories which make up this collection are presented as submitted, capturing the experiences of those who have shared them in their own words — reflecting their individual views, interpretations, and conclusions. Together, let’s consider some questions which will help you to think through and share your own Humanities Moment. Objects from any of these fields (books, poetry, works of art, or pieces of music, for example), or which employ an analytical lens specific to one of these fields, are concrete examples and products of the humanities. The humanities and humanistic endeavors may also be used more broadly to describe particular ways to explore and think critically about the human experience. Unlike more quantitative or technical modes of investigation, the humanities generally do not seek a correct, logical, or finite answer to questions. In their truest form, the humanities are about unsettling preconceived ideas, adding complexity to existing knowledge, entertaining a diverse set of voices and perspectives, questioning our sense of identity and place in the world. When we align ourselves with such a curious, open-minded pursuit of knowledge, we are bringing the humanities to life. What is a Humanities Moment? At their core, Humanities Moments are about what happens to our personal perspectives and lived experience when we encounter the humanities in one of the ways described above. It is not necessary for a Humanities Moment to be academic or formal in nature. Often, the best Moments occur when we start with a particular object or experience that has special relevance for us. When writing your Moment, first make sure that it actually involves or refers to an element of the humanities. Then ask yourself how and why it affected you so strongly. Make sure to include lots of detail, including your intellectual, emotional, and aesthetic responses! The humanities affect and move us in a multitude of ways and we strive to highlight everyone’s unique experience. How should I begin to articulate my Humanities Moment? Since they are intertwined with the unique perspectives and experiences of individuals and their encounters with very different source materials, Humanities Moments vary widely from one another. Here are some suggestions to help you consider the ways that the humanities may have impacted different areas of your life, consciously or unconsciously. Of course, you are by no means limited to these questions or suggestions. What is the last film you saw that you couldn’t stop discussing with friends, family, or strangers on the Internet? How did it spark your wonder, fuel debates, and make you rethink your expectations for cinema, visual art, and forms of representation? What is your favorite book, either as an adult or as a child? Why does it mean so much to you? Did it echo your sensibilities and experiences or shake up your entire worldview? Are there particular people or places which are meaningful to you because of their connection to this book? What is the last piece of art you saw which stopped you in your tracks? Was it displayed in a museum? On the walls of an elementary school? Graffitied on the side of a building? What stood out to you visually? What kinds of connections did it allow you to make? Has the act of traveling and encountering other cultural traditions changed your perspective on those cultures or your own in significant ways? Have you encountered manuscripts, artifacts, or art in the context of museums or exhibitions which affected you? What is a song that you love, or hate, or perhaps hate to love? How do its sonic elements affect you emotionally? Do elements such as the rhythms, tempo, and instrumentation inspire a certain kind of response? Does this song remind you of a particular experience or point in your life?